Second Timothy offers a picture of Paul at the end of his ministry, just before his death. Details reveal a man settling his accounts. 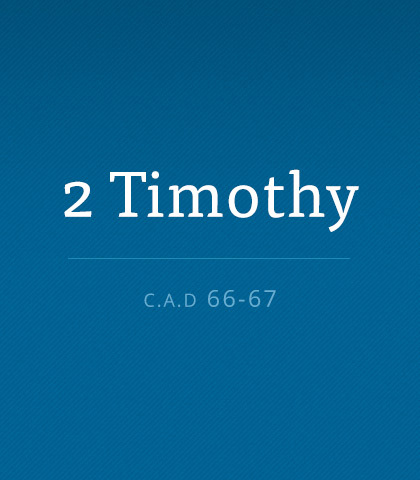 Read more about the book of Second Timothy. Following Christ ought to come with a warning label: Christianity is a battleground, not a playground. Paul ran to win (2 Timothy 4:7–8) and he wanted the same for Timothy. But how? Here are four ways to finish well, found in 2 Timothy 3:14–17. It’s doubtful that we could find a more nostalgic, emotional letter written by the Apostle Paul. Facing death alone in a dungeon, surrounded by memories, and exposed to the elements, this grand old man wrote by candlelight a letter to his dear friend, Timothy. Paul had no assurance it would ever reach him but, nevertheless, he wrote it. And we are so grateful he did! A last will and testament of sorts, 2 Timothy is filled with strong exhortations, insightful instructions, and intimate reflections—and it spurred Timothy onward in his race of faith. It will do the same for us…if we hear and heed its admonitions. Stiffen your resolve! Paul gave us five steps to do just that. All that’s left is for you to answer one question—a question only you can answer. Are you willing to give God your very best? Questions about God and His Word are natural. When questions come, we shouldn’t be afraid to ask them in honest humility. Q & A: How Can I Make a Positive Impact in Others' Lives? When we see the value and potential in others and then convey to them what we see, we are making a positive impact. Here are eight ways we can learn to affirm others and make a positive impact in their lives. Timothy ministered in Ephesus, some 830 miles to the southeast. Ministry was troublesome. Heretical hounds barked and bit. And the naturally reserved Timothy had grown weary and timid. A few tender words from his mentor were just the boost of confidence and courage the young pastor needed. Onesiphorus played a vital role in Paul's life through his rare yet wonderful ability to give breathing room, to provide cooling relief, and to help in the healing process.